What would you say is at the heart of most guitar music? These and many other guitar pieces use a combination of chords and arpeggios. Do exercises like that get you closer to the heart of guitar music? Do they have any resemblance to those well-known guitar pieces you've always wanted to play? After studying hundreds of method books from the 18th and 19th centuries, it's pretty clear that the old masters weren't practicing exercises like those. - They were practicing chord progressions. And lots of them. - They were also practicing arpeggios and combining those with the chord progressions. That is what gets you towards the heart of guitar music. There are many chord progressions out there to practice, so where can you start? You don't have to analyze the chords before playing them. In fact, it's better to get them under your fingers before you try understanding them. Isn't that a totally different mindset than what is taught today?! Today we're told to read textbooks or watch lectures of people explaining harmony before we dare to practice it. But according to Czerny (Beethoven's pupil!) this is backwards. I want to introduce you to the Rule of the Octave (ROTO), which is a totally forgotten and overlooked chord progression. It was part of an 18th/19th century composer's toolkit. It's very likely that guitarists including Sor, Giuliani, Aguado, Mertz and others of this pedigree were aware of the ROTO. The ROTO is essentially a scale that's been harmonized with chords (the bass line is an ascending and descending scale). This has been done in a way that teaches you the laws of harmony - things like tension and resolution, voice leading, etc. 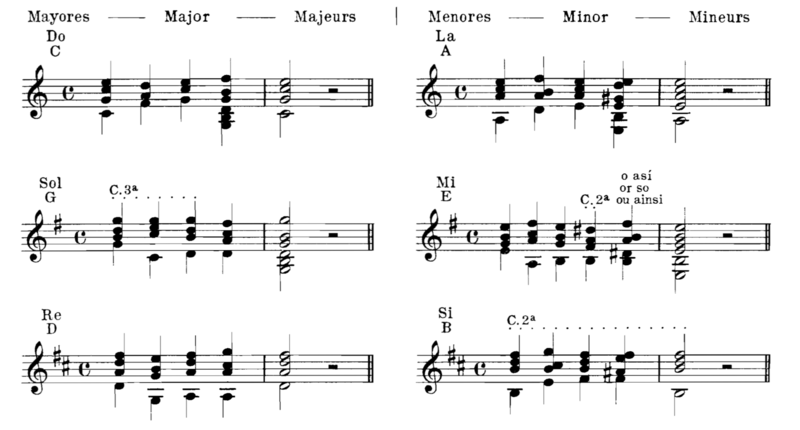 The same chord progression is used for each key - one for major and one for minor. It really is a beautiful chord progression to practice and also makes for a very effective technical study. Combine the ROTO with arpeggios and you are really getting close to the heart of guitar music. You can add Giuliani's 120 right hand exercises (click here to download) - you can finally make great use of those studies! Watch the video to see how you can apply arpeggios to chords for a great exercise. Re: What did the old masters practice? Thank you, Daniel. This is very helpful!